The next morning we set out from Nauplio for Athens, where we had an appointment to return the rental car that afternoon. 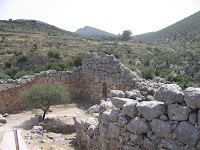 We drove leisurely eastward toward Epidauros, stopping to see the remains of a few Mycenaean bridges, and enjoyed the winding road, through tight gullies and over small hills. 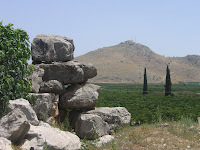 There were several apricot orchards along the way, and, of course, the ever-present olive trees. Perhaps we were a bit too relaxed, because we made more than one wrong turn on the way to Epidauros, although, the road signs throughout Greece, with inaccurate mileage, can be terribly confusing. 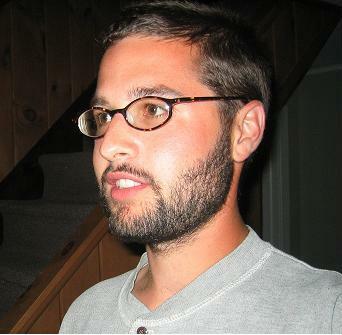 There was no thought, however, of missing the famed theater, even if it meant paying a late fee on the car. And it was a lovely detour. When we finally arrived at the site, there were just a few cars in the parking lot, and some buses lined up. The theater isn't immediately visible; we walked along a shaded path, passing a youthful group on its way out. 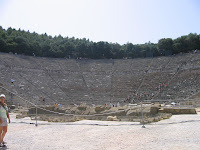 As we neared the top of the gentle incline, the sunshine let us know that we were approaching a clearing; and finally there it was: the enormous grandeur of a perfectly preserved Greek amphitheater. It was larger and more impressive than I had imagined. There were visitors scattered sparsely in the seats, and young French school children were taking turns at the center of the orchestra, giving speeches with gentle voices which easily reached their schoolmates in the stands. 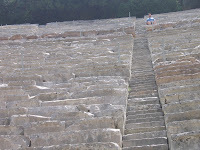 We climbed one of the staircases nearly to the top row and sat quietly for several minutes. 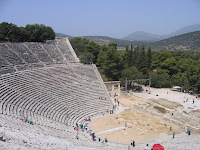 In my mind, I was suddenly among a throng of Greek speakers, bustling to their seats through the narrow walkways, ready to watch a play of no particular title (though it was certainly one of the lost tragedies). After that fantasy, we followed the top row around to the middle, and sat again, looking out at the vast landscape, and I wondered if this spectacular view, with the excitement of a performance, just faded completely from the attention of the crowd. I sat for as long as I could in the hot sun, and then descended to the orchestra level once again. There was lighting equipment set up all around for the events that are still staged at the theater. 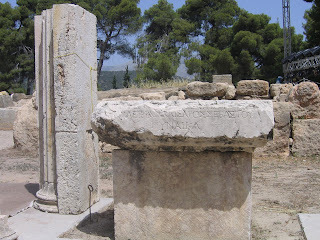 A few carved pieces stood nearby, including this one with an inscription ending with the word ΓΥΝΑΙΚΑ. 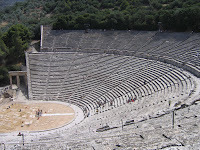 One theme of my whirlwind Greek tour was the agonizing decision of what to see and what to skip, and, with our pressing appointment, and the promise of travel on the wine-dark sea to the Greek Isles, we pressed on without exploring the site thoroughly. 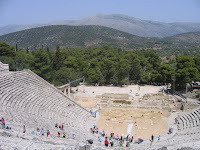 There is also a lost play by Euripides, the Bellerophontes, of which a few fragments survive in other authors, suggesting that it dealt with his attempt on Olympus. 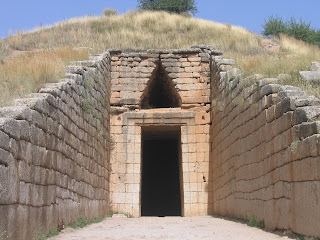 My visit to Tiryns was especially pleasant because absolutely nobody else was there. It was a sweltering hot day during the heat wave at the very beginning of the devastating fires this summer. 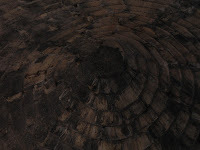 The site, of course, is made up of dirt and rocks in the direct sun, with one very slight tree for shade, under which I rested more than once. 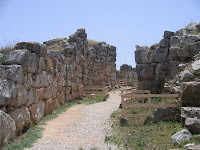 In order to enter the city you pass through what were once two gates. 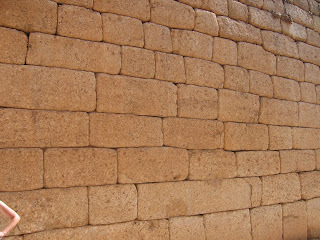 Some of the largest stones are incorporated in this part of the wall. 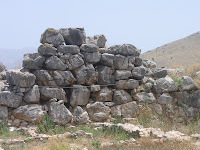 The upper part of the site has the remains of a megaron and surrounding rooms. In one of these rooms was a pit in the corner which looked very much like a toilet, with a stone drainage system leading into the ground, and, indeed, I later discovered that the site map at the National Archaeological Museum in Athens labels it as such. 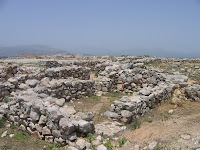 The lower part of the site is an open space, with what looked like storage rooms along the west wall. There were two very interesting tunnels leading through the wall, but they were both off limits, and heavily supported with metal braces. There were almost no signs here of a tourist destination, and I cherish that experience of exploring an ancient site in silence and solitude, at my own pace, and without any supervision. In my imagination I was stumbling upon a mysterious bronze age site, but, of course, it would not be nearly as interesting if it weren't for the work of archaeologists. 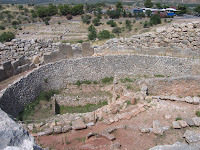 The sunken beehive-shaped structure below the walls of Mycenae known as the Treasury of Atreus, or sometimes the Tomb of Agamemnon, is the largest of the nine θόλος tombs outside the city walls. 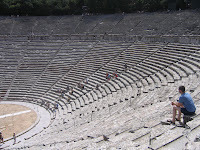 It is impossible to rate my impressions of all the wonderful things I saw in Greece, but this was one of my favorite experiences of the trip. 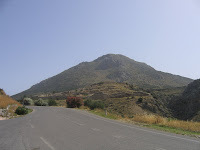 It sits on the left side of the road approaching Mycenae, so we could see the commanding position of the citadel above us as we pulled off the road to see the treasury first. Just as we arrived at the site, a tour group was leaving, so we had the site to ourselves for perhaps twenty or thirty minutes. The stonework is awesome. These stones were cut and placed with remarkable precision many centuries before the grand structures of the classical period, and even today they remain in perfect condition, with hairline seams between the monstrous blocks. 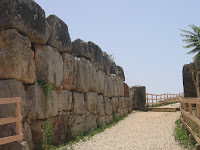 The retaining walls defining the dromos, or entryway, grow taller and more imposing as you approach the entrance; it runs a length of 36m and is 6m wide. 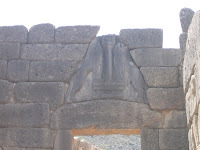 The lintel stone alone weighs 120 tons. 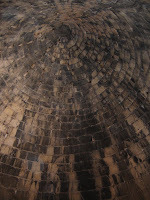 As I walked through the doorway, my eyes adjusted from the bright sunshine outside, and the pitch darkness gave way, revealing a marvelous and solemn circular space, 14.6m in diameter and 13.4m high, with 33 courses of stone creating a perfect dome. 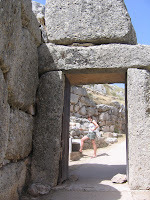 There is a side chamber, 6m square and 5m high, with the same void triangle above the entrance that appears above the main doorway; it helps to relieve weight from the lintel stone. The side chamber was roped off and completely dark; I took a picture with a flash, but it shows little more than your imagination would. Along the perimeter are some stones which provided lovely seating as I sat and read from my edition of the Iliad for a few minutes, enjoying a quiet moment in the shade of the blistering sun, overwhelmed by the bronze age history, and the more recent tradition of professional and amateur visitors who have documented the structure ad nauseam. 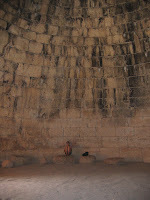 I could have sat there all day in the cool air and read from Homer with occasional glances up to the pinnacle of the domed stonework; but too quickly another guided group arrived at the scene and broke the silence. After seeing the citadel and the museum, I returned to the treasury to shoot a short video with my digital camera. I wish I had thought to do that earlier, when I had the site all to myself, but by this time there were several groups of visitors. 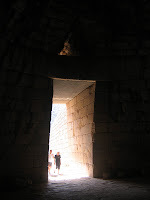 After enjoying the delightful evening in Nauplio, it was all I could do to wait until the next morning to visit Mycenae. 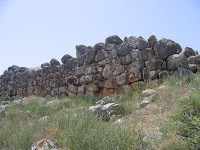 We backtracked past Tiryns, whose monstrous walls were calling out to us, and continued on the same road that brought us to Nauplio. Coming from that direction, we took a right onto a smaller road leading to the site, and went through the nearby town with no shortage of theme-based restaurants and gift shops. 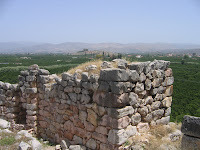 The hilltop housing the citadel is visible as you ascend the only road and pass the Treasury of Atreus. 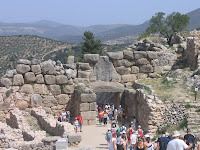 As you walk up the path leading to the Lion's Gate entrance, you can see the results of excavation just outside of the walls (look for some great work soon on extra-palatial economics by Panagiota Pantou). 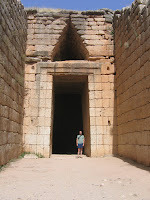 The Lion's Gate itself was as impressive as I had imagined, although there were no herds of tourists filing through in my mental image. As you enter, on the right, is the famous Grave Circle A, from which we have many of the famous artifacts uncovered by Schliemann, and which must have been important to the inhabitants, as it was included within the city when the Cyclopean walls were assembled. 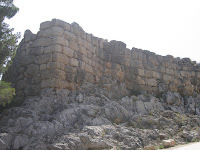 Farther into the distance is the road and the Treasury of Atreus, and the lower landscape dotted with fields which must have sustained the citadel in ancient times. 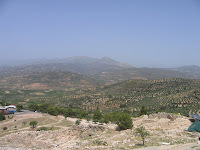 On the opposite side of the site is a dramatic downward drop, and then the quick, steep, rocky rise of the mountains. 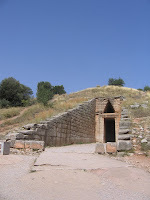 The path winds upward to the site's very pinnacle, where the court and megaron were located. From this height there is an astounding view of the surrounding landscape that must have been a rewarding sight for a ruling king. 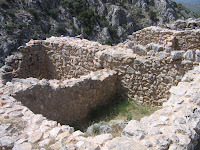 The path continues downhill to the rear of the site, with a smaller northern gate, and a subterranean stairway leading to a cistern. 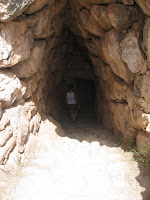 We walked curiously down the initial flight of stairs into the dark tunnel, and then paused for a bit, looking down into the complete darkness. There was no warning to stop, or of any danger, but it would have been impossible to continue without some kind of lighting. We decided to take a picture with the flash, which showed more stairs, with metal braces holding the ceiling up, continuing around the corner to the right. 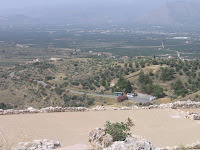 Standing at the very top of the site I could not help but imagine Agamemnon, looking out proudly over the fields before his kingdom, like the king on the Shield of Achilles (Iliad 18.556): βασιλεὺς δ᾽ ἐν τοῖσι σιωπῇ | σκῆπτρον ἔχων ἑστήκει ἐπ᾽ ὄγμου γηθόσυνος κῆρ. 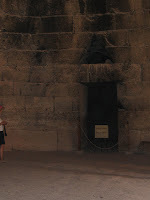 The Treasury of Atreus, which sits several hundred meters from the citadel, deserves its own post, coming soon.